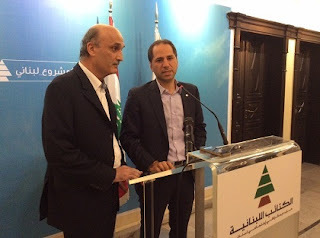 Lebanese Forces leader Samir Geagea on Thursday visited the newly-elected chief of the Kataeb Party MP Sami Gemayel at the latter's headquarters in Saifi. “Bringing together the political forces is necessary in any attempt to make a change and this is the aim of the current contacts,” Geagea announced after the talks. “The visit is mainly aimed at congratulating MP Sami Gemayel” on his election as Kataeb president, the LF leader added. “We have not reached a common vision regarding the presidency or the issue of sovereignty, but we will continue with dialogue,” Geagea said, referring to the LF-FPM dialogue. “We always discuss certain topics with Kataeb but we agree 99% on the political agenda,” he noted. As a suggestion to resolve the presidential crisis, FPM leader MP Michel Aoun has recently proposed organizing a survey to determine which Christian party or parties are the most influential in the country. His idea has garnered the support of Geagea and Marada Movement chief Suleiman Franjieh amid reservations by Kataeb. Baabda Palace has been vacant since the term of President Michel Suleiman ended in May last year. The rivalry between Aoun and Geagea is partly to be blamed for the presidential deadlock. The two leaders had announced earlier this month a declaration of intent, which as a first step, will likely be put into effect through the implementation of Aoun's proposal to carry out the poll.